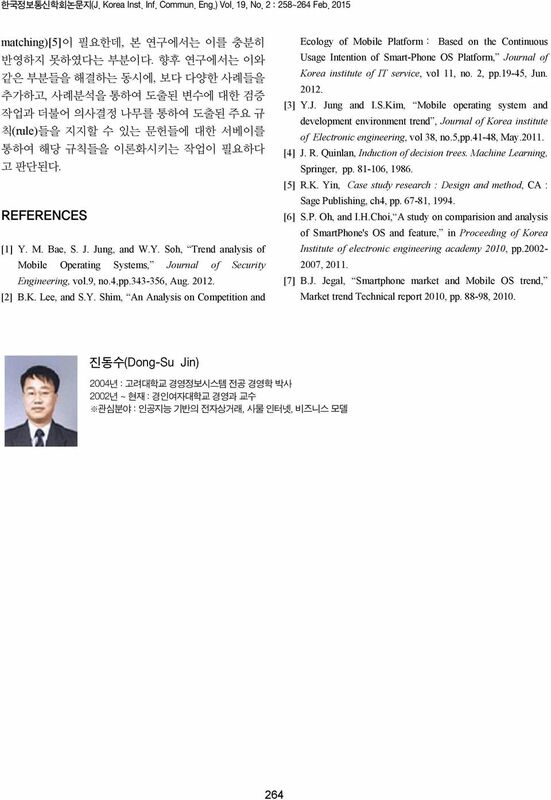 1 Journal of the Korea Institute of Information and Communication Engineering 한국정보통신학회논문지(J. Korea Inst. Inf. Commun. Eng.) Vol. 19, No. 2 : 258~264 Feb ID3 알고리즘 기반의 귀납적 추론을 활용한 모바일 OS의 성공과 실패에 대한 연구 진동수 * Research on Success and Failure of Mobile operating system using inductive learning based on ID3 algorithm Dong-Su Jin * Department of Business administration, Kyungin womens s University, Incheon , Korea 요 약 본 연구에서는 최초로 출현한 모바일 운영시스템인 Palm OS을 시작으로 주요 모바일 운영 시스템의 성공과 실패 에 영향을 미치는 요인들이 무엇인지 제시하였다. 이를 위하여 성공한 사례와 실패한 사례에 대한 분석을 실시하고, 성공과 실패에 영향을 미치는 주요 변수를 도출한 후 이를 기반으로 ID 3 알고리즘 기반의 귀납적 분석을 실시하였 다. 이를 통하여 모바일 운영 시스템의 성공과 실패에 있어서의 규칙들을 도출하여, 모바일 운영 시스템이 상업적으 로 성공하는데 혁신성과 글로벌화 관점에서 전략적 시사점으로 제시하였다. ABSTRACT This research suggests critical factors affecting success and failure of several commercial mobile operating systems from Palm OS appearing in to main mobile OSs appearing in For this, we analyses several mobile operating cases, elicit factors affecting success and failure of mobile OS, and conduct ID3 based inductive learning analyses based on elicited factors and values in case dataset. Through this, we draw rules in success and failure of mobile OS and suggest strategic implications for the commercial success of mobile OS in perspective of innovation and globalization. 키워드 : 모바일 OS, 귀납적 추론, ID3 알고리즘, 혁신성, 글로벌화 Key word : Mobile OS, Inductive learning, ID3 algorithm, Innovation, Globalization 접수일자 : 심사완료일자 : 게재확정일자 : * Corresponding Author Dong-Su Tel: ) Department of Kyungin women s University, Incheon, , Korea Open Access print ISSN: online ISSN: This is an Open Access article distributed under the terms of the Creative Commons Attribution Non-Commercial License( by-nc/3.0/) which permits unrestricted non-commercial use, distribution, and reproduction in any medium, provided the original work is properly cited. 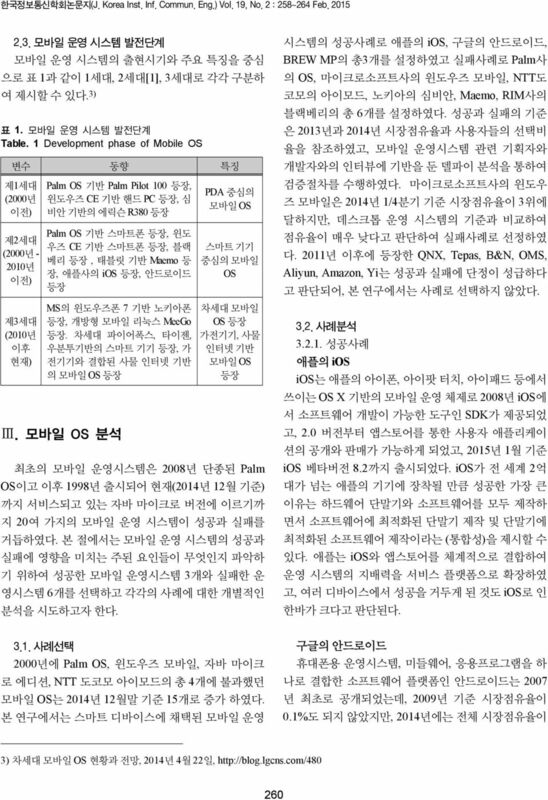 Copyright C The Korea Institute of Information and Communication Engineering. 참여정부의 과학기술 기본계획 2003. 5 재정경제부 교육인적자원부 통일부 외교통상부 국 방 부 과 학 기 술 부 문 화 관 광 부 농 림 부 산업자원부 정보통신부 보건복지부 환경부 건설교통부 해양수산부 국무조정실 기획예산처 목 차 요 약 1 제1부 국가과학기술비전 Ⅰ. 과학기술기본계획 수립의 배경과 의의 25 Ⅱ. 국내외 과학기술 환경 변화와 과제 27 Ⅲ.